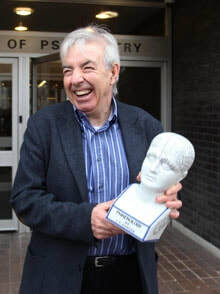 Sir Robin Murray is Professor of Psychiatric research at the Institute of Psychiatry and is concerned with finding the causes of psychosis, and improving its treatment. His early work challenged the prevailing view of schizophrenia as an adult-onset brain disease, instead demonstrating that it is in part a neurodevelopmental disorder. He and his colleagues have shown that that environmental factors such as obstetric events, childhood adversity, migration, and heavy cannabis use are all risk factors for psychosis. Robin is the most widely cited schizophrenia researcher outside the USA and was knighted by the Queen in 2011. He is one of only four psychiatrists ever to be elected to the UK Royal Society. ​Marta Di Forti is an MRC clinical scientist working at the Institute of Psychiatry. Her work identified a particularly increased risk of psychosis following use of high-potency cannabis, particularly in adolescence. The clinical population she cares for comprises young people suffering from their first episode of psychosis. Her clinical work plays a crucial role in informing and inspiring her academic interests. Marta currently researches the interaction between genes and cannabis in causing psychotic disorders and worsening the outcome. Daniele La Barbera is Full Professor of Psychiatry at Palermo University and the Chairmen of the Psychiatric Unit of Palermo University. His main areas of interests are psychosis, the relationship between substance abuse and psychiatric disorders, and the psychological features of new technologies. He coordinated the Sicilian Psychosis and Genetic Study (SGAP) an incidence and a case control on first episode psychotic patients. Dr. Anton Grech was born on 16 November 1967 in Gozo, Malta. He graduated as Doctor of Medicine from the University of Malta in 1992. He became a Member of the Royal college of Psychiatrists, UK, in 1997, and he became a Fellow of the same college in 2011. In 1999 he obtained an M.Sc. in Psychiatry from King’s College, University of London. He trained and worked at the Maudsley Hospital in London, between 1994 and 1998. During 1998 he was also a Clinical-Academic Lecturer in the Department of Psychiatry, Institute of Psychiatry, King’s College, University of London. Between 1999 and 2002 he was Honorary Researcher within the same Department. In 1999 he proceeded to Malta, where he was Senior Registrar in Psychiatry until 2003, when he was appointed Consultant Psychiatrist with a special interest in Addictions and Neuropsychiatry. In 2000 he was appointed Lecturer in Department of Psychiatry of the Faculty of Medicine and Surgery of the University of Malta, and in 2008 he was appointed as Senior Lecturer within the same Department. In 2011 he was appointed as Senior Research Fellow in the Bedfordshire Centre for Mental Health Research in association with the University of Cambridge, United Kingdom. In 2011 he was also appointed as Clinical Chairman of the Department of Psychiatry in the Ministry of Health, Malta. His main research is on the aetiology of schizophrenia, and it was based at the Institute of Psychiatry London and at the University of Malta. He has published in international psychiatric journals, and presented and chaired in international psychiatric conferences. In 2008 he was chosen as one of the 30 European Scientists to be featured in the book ‘Portraits of Science; Scientists of Tomorrow’, published by the European Federation of Pharmaceutical Industries and Associations, to commemorate its 30 th anniversary. In 2013 he was appointed Chairman of 'Fundazzjoni Kenn Ghal Sahhtek', a foundation in collaboration between Community Chest Fund and the Government of Malta. He is a member of various national boards and commissions. He believes a lot in using the media to educate on mental health, and for the last years in Malta he conducted radio and TV programmes on issues related to mental health. Nikos C. Stefanis MD, FRANZCP, is Professor of Psychiatry at the National and Kapodistrian University of Athens Medical School and vice-director of the University Mental Health Research Institute in Greece. He is the chair of the First Episode Psychosis Task Force within the World Federation of Societies of Biological Psychiatry. He worked as Professor of Psychiatry at the School of Psychiatry and Clinical Neurosciences, The University of Western Australia (2010-2013). In his current capacity as a consultant psychiatrist he runs a national referral center for First Episode Psychotic Disorders at Eginition teaching Hospital, A’ Department of Psychiatry, National and Kapodistrian University of Athens Medical School (since 2016). He trained in Psychiatry at the Maudsley Hospital / Institute of Psychiatry in London UK and in Cognitive Behavior Therapy at Oxford University. He joined the faculty of the Dep/ment of Psychiatry at the National and Kapodistrian University of Athens Medical School in 1999 as a lecturer, receiving tenure in 2008. He has received grants from the Onasion Foundation Scolarship in Greece, The Greek Ministry of Research and Technology, the European Regional Development Fund, and the National Institute of Mental Health USΑ with Prof. D. Avramopoulos. His main academic interests have gravitated towards the better understanding of the complex interplay between genetic and environmental risk factors that shape the vulnerability for major psychiatric disorders. His academic work has been published in more than 70 high impact international peer reviewed journals: Impact factor ~ 380 (Google Scholar H index 28 citations 3660). Regius Professor of Psychiatry, Institute of Psychiatry, Psychology and Neuroscience (IoPPN), King’s College London. President, Royal Society of Medicine (RSM). Simon Wessely studied medicine and history of art at Trinity Hall, Cambridge and University College Oxford, graduating in 1981. He obtained his medical membership in Newcastle, before moving to London to train in psychiatry at the Maudsley. He has a Master’s and Doctorate in epidemiology. He is consultant liaison psychiatrist at Maudsley and King’s College Hospitals. He founded the King’s Centre for Military Health Research. Its flagship project is a large-scale ongoing study of the health and wellbeing of the UK Armed Forces, has had a direct impact on public policy and on forms of treatment and help for Service personnel. Professor Wessely has over 750 original publications, with a particular emphasis on the boundaries of medicine and psychiatry, unexplained symptoms and syndromes, military health, population reactions to adversity, and epidemiology, He is active in public engagement activities, speaking regularly on radio, TV and at literary and science festivals. He is a trustee of Combat Stress and his contributions to veterans’ charities include cycling (slowly) eight times to Paris to raise funds for the Royal British Legion. In 2012 he was awarded the first Nature “John Maddox Prize” for Standing Up for Science, and was knighted in 2013 for services to Psychological Medicine and Military Health. Between 2014-2017 he was President of the Royal College of Psychiatrists. Professor Allan Young holds the Chair of Mood Disorders and is Director of the Centre for Affective Disorders in the Department of Psychological Medicine in the Institute of Psychiatry at King’s College London, UK. Prof Young is the National Institute for Health Research (NIHR) Mental Health Biomedical Research Centre (BRC) Theme lead in the Translational Therapeutics Cluster. Prof Young is the clinical academic lead in the Psychological Medicine and Integrated Care Clinical Academic Group in the South London and Maudsley NHS Trust where he is also a Consultant Psychiatrist and the head of the National Affective Disorders Tertiary Clinic. Professor Young’s research interests focus on the cause and treatments for severe psychiatric illnesses, particularly mood disorders. Professor Young is a member of a number of editorial boards and of numerous professional and scientific societies. He is currently President of the International Society for Affective Disorders and President Elect of the British Association of Psychopharmacology. Mario Maj is an Italian psychiatrist who has been President of the World Psychiatric Association (2008-2011) and of the European Psychiatric Association (2003-2004). He is the founder and Editor of World Psychiatry, the official journal of the World Psychiatric Association, which has a 2016 impact factor of 26.561. Mario Maj is Chairperson of the Working Group on Mood and Anxiety Disorders and member of the International Advisory Board for the chapter on mental disorders of the International Classification of Diseases, 11th edition (ICD-11), and has been member of the Work Group on Mood Disorders for the American Psychiatric Association’s Diagnostic and Statistical Manual of Mental Disorders, 5th edition (DSM-5). As a researcher, Mario Maj is especially known for his contributions in the area of bipolar disorder, including the clinical characterization of rapid cycling mixed states, and psychotic depression, and the study of the determinants of response to prophylaxis with lithium salts. Prof Eric Taylor is Emeritus Professor of Child and Adolescent Psychiatry at King’s College London, Institute of Psychiatry and is an honorary consultant at the Maudsley hospital. He has developed specialist clinics for child neuropsychiatry and higher training for child and adolescent psychiatry. His research has included longitudinal epidemiology, nosological distinctions within the ADHD spectrum, neuropsychology and neuroimaging, molecular genetics and treatment trials. Prof Taylor has chaired the NICE guidelines development group for ADHD, was senior author for the various European Guidelines from EUNETHYDIS and also a Trustee of the National Academy of Parenting Practitioners and a Non-Executive Director of the South London and Maudsley NHS Foundation Trust. He is a Fellow of the Academy of Medical Sciences, an Honorary Fellow of the Royal College of Psychiatrists, and a Board Member of the Association for Child and Adolescent Mental Health and Place2Be (providing mental health services to schools). Dr Graham Murray is a University Lecturer in the Department of Psychiatry and Behavioural and Clinical Neuroscience Institute at University of Cambridge. He studied Physics and Philosophy at Oxford, Medicine at King’s College London, and postgraduate psychiatry in Cambridge. He has a doctorate in cognitive epidemiology from University of Oulu in Finland, and a doctorate in cognitive neuroscience from University of London. In his clinical work Dr Murray is Consultant Psychiatrist in the Cambridge early psychosis service, CAMEO. He draws on a variety of research methods, including brain imaging, population neuroscience, psychopharmacology, and computational psychiatry. His current research is focused on delineating the causal pathways from schizophrenia risk factors to pathophysiology, and elucidating the brain mechanisms of delusions and hallucinations. Dr Fiona Gaughran is the Lead Consultant in the National Psychosis Service at the South London and Maudsley NHS Foundation trust (SLaM). She is also the Director of Research and Development for SLaM and a Reader in Psychopharmacology and Physical Health at the Institute of Psychiatry, Psychology and Neuroscience. As part of her role, Dr Gaughran is responsible for implementing new, evidence-based approaches to help people with psychotic illnesses that have been resistant to treatment. She also has a keen interest in the physical health of people with psychosis, in 2015-16 chairing the “Stolen Years” group for NHS England’s Healthy London Partnership, helping clinicians and commissoners plan services to reduce early mortality in people with psychosis across London. Dr Gaughran obtained her basic medical degree at University College, Dublin. As a postgraduate, she worked in internal medicine before starting her psychiatry training. On moving to London, Dr Gaughran became Consultant Psychiatrist and Senior Lecturer in the Trust in Lewisham and moved to her current role in 2008. Dr Gaughran is a fellow of the Royal Colleges of Physicians in both London and Dublin and a fellow of the Royal College of Psychiatrists. Dr Gaughran has a particular interest in translating research into clinical practice and over the years has secured substantial research grant income to support this work. Her current research interests are largely focused on the interface between physical health and severe mental illness and on the management of psychosis. She has published over a hundred papers and book chapters and recently co-edited books on “Treatment Refractory Schizophrenia” and “Physical Health in Schizophrenia”. Kate Tchanturia, PhD, is a lead clinical psychologist in the national eating disorder service at Maudsley hospital, visiting Professor in Tbilisi Ilia State University, who has worked in the field of clinical and experimental psychology for thirty years. Over the last two decades, her clinical and academic work in the King’s College London Department of Psychological Medicine and the South London and Maudsley NHS Eating Disorder Service has focused on translational research to promote good clinical practice. Dr. Tchanturia has published 200 peer reviewed papers reporting experimental studies of cognitive processing and emotion in eating disorders, as well as their cultural presentations. She was recipient of Royal Society, Wellcome Trust, NHS innovation, BRC, MRC and Swiss Anorexia Foundation awards. She has lectured internationally and trained clinicians and researchers in the UK, USA, Europe, South America, Japan, New Zealand and Australia in the Neuropsychology of Eating Disorders and how to translate it into cognitive and emotional remedial approaches. Caterina La Cascia (Erika), is a clinical psychologist, PhD in neuroscience and behavioral disorders, and assistant professor at Department of Experimental Biomedicine and Clinical Neuroscience in University of Palermo. She works also as a clinical psychologist and psychotherapist at Unit of Psychiatric of University Hospital of Palermo. Her main interest in research is in Psychosis, particularly in use of cannabis and psychosis onset, and in psychiatric rehabilitation. Laura Ferraro is a PhD in Clinical Medicine and Behavioural Sciences and a Psychologist and Cognitive Psychotherapist. She has been working in the research field until July 2009 when she started her four-years research fellowship grant in schizophrenia research at University of Palermo, where she is currently working as a teacher. She is interested in psychosis, particularly in cannabis use, cognition, and premorbid adjustment.